There is a presence of interarticular space between the bony components of the temporomandibular joint (TMJ), i.e., between articular eminence and glenoid fossa of the temporal bone at the base of the skull and the condylar process of the mandible. The intervening articular disc, together with its attachments, divide the joint into two separate compartments, i.e., upper (superior) and lower (inferior) compartments located above and below the disc, respectively, which are referred as joint spaces. The clinical significance of joint space is of great value; the presence of normal joint space is needed for free movement of condyle along with articular disc. The widening or obliteration of joint space may indicate the involvement of TMJ or its pathology. The joint space configuration is greatly influenced by the glenoid fossa, condyle, and condylar positions within the fossa in TMJ on the right and left sides. The present review work is undertaken primarily including 37 studies from PubMed and Medline databases to reveal the information relating to the joint space, its measurement in normal subjects and TMJ disorder (TMD) patients, its correlation to other factors, and its role in TMDs. The review work would be of help to gain insight to predict the TMDs with respect to joint space morphometrics. There is no quantitative standard for the optimal position of mandibular condyle in the glenoid fossa in the population. However, it appears that the mandibular condyle is usually in central position in the glenoid fossa when teeth are in occlusion; it means that a condyle is positioned concentrically when the anterior and posterior aspects of the radiolucent joint space are uniform in width., The condyle is retruded when the posterior joint space (Pjs) width is less than the anterior and protruded when the anterior joint space (Ajs) is narrower. The radiographic outline of condyle and glenoid fossa does not correspond to each other which contributes to its eccentricity in medio-lateral aspect to mild extent., The posteroanterior variation of condyle positions in asymptomatic TMJs is greater than commonly thought; further, it varies as per the type of malocclusion.,,, The condyle was positioned more anteriorly in the glenoid fossa in Class II division 1 cases as compared to Class II division 2. The Class III cases had wider and shallower fossa; the condyles were elongated and closer to the roof of the fossa. In pseudo Class III malocclusions, the mandibular condyles are out of the glenoid fossa due to functionally too forward position of the mandible. Paknahad and Shahidi observed that the patients with severe TMDs have posteriorly seated condyle whereas with mild-to-moderate TMDs have concentric and anteriorly seated condyle. The term radiographic joint space or radiographic interarticular space refers to the radiolucent area between the glenoid fossa and the condyle and should not be confused with the superior joint space (Sjs) and inferior joint space above and below the articular disk, respectively. Thus, the radiographic joint space contains the disc, soft tissue components of the joint, and synovial fluid. The Ajs, Sjs, and Pjs can be measured on sagittal images of TMJ ,,,,, and the Mjs, Sjs, and (Ljs) can be measured on frontal or coronal view.,,, In addition, joint spaces can be measured in axial view of the condyle., In most of the previous studies, the joint space measurement was done in sagittal view using the method described by Pullinger and Hollender. Ljs: Expressed by the narrowest/shortest distance between the most lateral point of the condyle and the lateral wall of the mandibular fossa. Kamelchuk et al. attempted to establish a quantifiable method of TMJ space analysis using multidirectional axially corrected tomography. For each joint, the medial, lateral, and central image slices were obtained, traced three times each, and then triplicated for drafting. After randomization and blinding, all the tracings and draftings were measured manually with digital calipers and subjected to analysis. The process was repeated for simulated head rotations of ±10°. There were no significant differences in joint space analysis between −10°, 0°, and +10° of head rotation. It was concluded that the joint space analysis is unaffected by head rotation and this method of joint space analysis has a high reliability as determined for each joint space position and simulated rotation. Henriques et al. have described the different measurement technique for joint spaces than that was used in most of the previous studies. Initially, the reference line was drawn tangentially to the lowest anterior and posterior extremities of the glenoid fossa. Then, vertical line was drawn from a mid-reference point to the first line; the anterior and posterior condyle to glenoid fossa distances were measured along the line at 45° to the base reference line drawn initially. 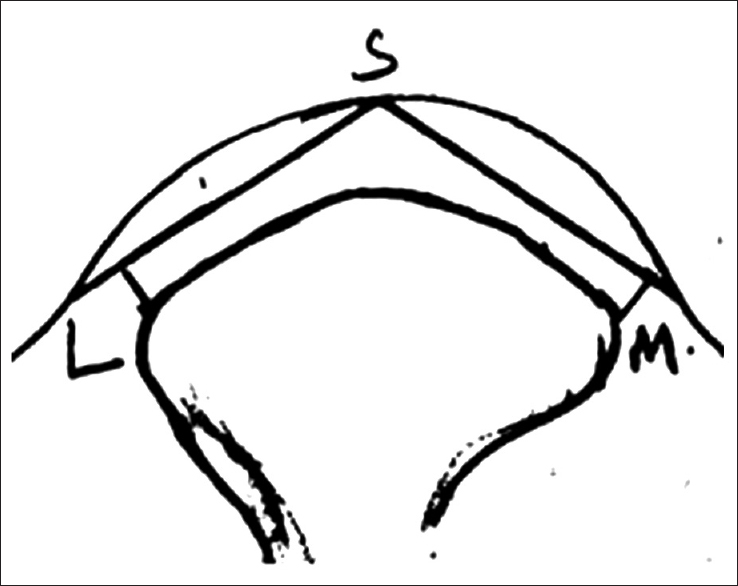 The distance between the uppermost point of the condyle and the closest internal point of the mandibular fossa was measured as superior distance. For measurements in frontal view, initially, the most medial and lateral points of the condylar head were connected to produce an alpha line. Later, a beta line was drawn overlapping the alpha line up to exactly half of its length; the end point of the beta line was termed as the middle point of reference. The mid-reference point and the uppermost point of glenoid fossa were connected, and the superior distance was measured between fossa and superior point of condylar head along with this line. The two lines were drawn at 45° to the alpha line on medial and lateral aspect; the closest medial and lateral distances were measured along these lines between condyle head and glenoid fossa. For the present review work on joint space measurements, a literature search was undertaken primarily through PubMed and Medline databases with the search expression “joint space, joint space measurements, condyle-fossa relationship.” The search included articles from 1950 to 2016; the 37 studies were relevant to the present review work. 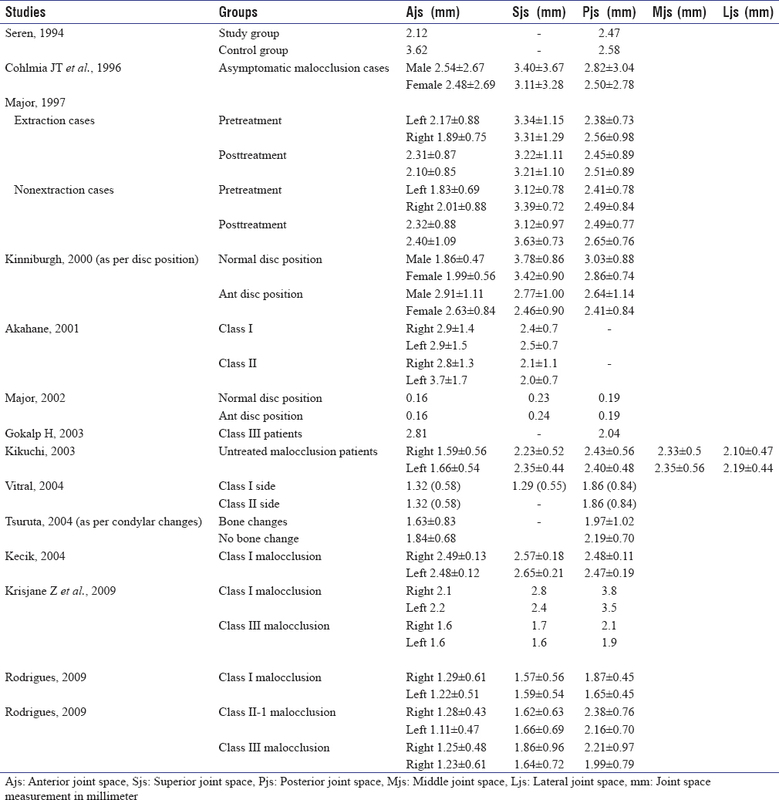 For all the included studies, the data relating to the joint space, its measurement in normal controls and TMD patients, and its correlation to other factors were obtained [Table 1], [Table 2], [Table 3], [Table 4]a and [Table 4]b. 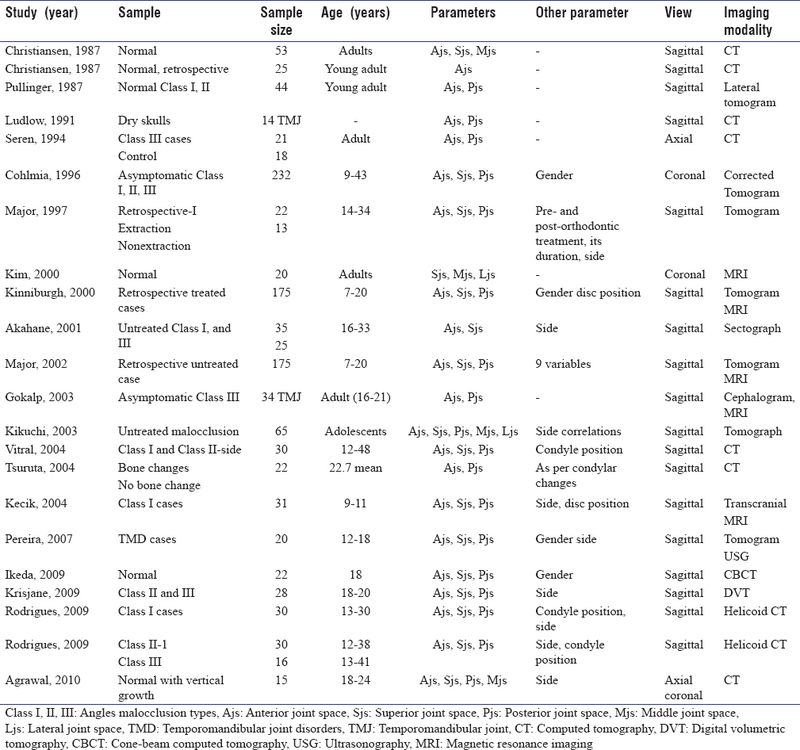 Earlier, various authors attempted to determine the joint space measurements in normal asymptomatic population without TMD [Table 1], [Table 2], [Table 3].,,,,,,,,,,,,,,, It was observed that the condyles are usually in centered position in the joint and there was mild correlation found between right and left joint relationships; hence, it was suggested that the assessment of joint spaces in the right and left sides should be done independently., A study by Pullinger and Hollender showed the concordance between anterior and posterior interarticular spaces with low interobserver variations. Christiansen et al., 1987 measured the joint spaces in two normal sample populations. The central-Sjs was found to be 2.2 and 2.3 mm; the antero-Sjs was 1.7 and 1.9 mm; and the Mjs-horizontal joint space 3.7 and 3.9 mm, respectively, for prospective and retrospective samples, while Kim estimated central joint space, Mjs, and Ljs in the coronal views in 30 joints to get the normal joint space width which could be used as a standard for comparing with the symptomatic joints. The mean joint space estimated was 2.77 ± 0.51 mm at medial, 3.57 ± 0.63 mm at center, and 2.41 ± 0.41 mm at lateral side of the mandibular condyle. The mean of joint space of male was wider than that of female but only in central measurement. The Ajs and Pjs were also estimated in 14 TMJs in dry skulls, and on the sectioned plaster casts of the impressions of actual joint space, here the individualized horizontal and vertical correction of the condylar axis was done to render joint more visible and joint space more measurable. 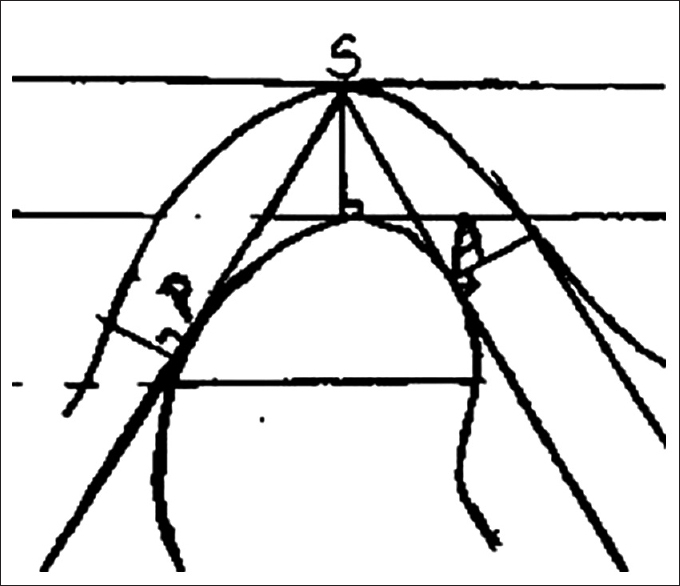 The measurement technique used by Henriques et al. was different than that used in most of the other studies. They have evaluated and compared the joint spaces or condyle to fossa distance in normal occlusion subjects in maximum intercuspation and centric relation position of occlusion and found no significant differences between them. Fraga et al. compared asymptomatic subjects with normal occlusion and malocclusions for joint spaces in turn for the condylar positions in the glenoid fossa. The least condylar decentralization was observed in the normal occlusion group, although, there was bilateral asymmetry in anteroposterior condylar positioning. In addition, Imanimoghaddam et al. investigated the relationship of joint spaces with the inclination of articular eminence. The significant correlation was observed between the Sjs and Pjs with an inclination of articular eminence in the normal group. Overall, the joint space measurements in previous studies in asymptomatic normal occlusion group [Table 3] lie approximately in the similar range except in few studies,,, where the values differed grossly than that could be estimated in other majority of the studies. Seren et al. observed very wide range of values for Ajs and Pjs, while Ikeda and Kawamura observed them too smaller and Agrawal and Jain estimated them to be in higher range as compared to other studies. Notably, most of the studies performed the joint space measurements in the sagittal view of TMJ followed by the coronal view, whereas Agrawal and Jain performed most of the measurements in the axial view. 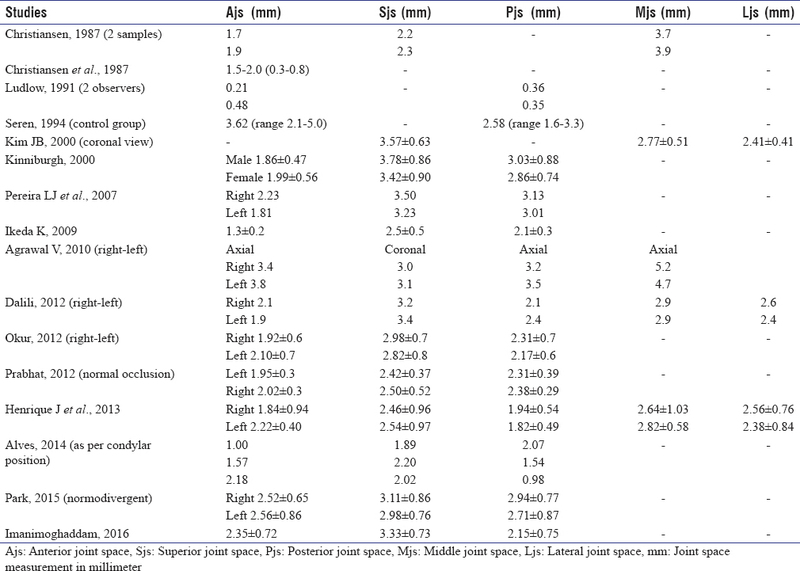 The various authors evaluated the joint space in symptomatic patients or patients with TMD or malocclusion [Table 1], [Table 2], 4a and b].,,,,,,,,,,,,,,,,,,,,,,,,,,, Overall, the mean values including standard deviation showed the similar ranges of joint space measurements, except in few studies ,, where the values were comparatively smaller. The gender-wise comparisons for the joint spaces revealed no differences for some of the studies.,,, However, Kinniburgh et al. found significantly greater Pjs in males as compared to females, also Cohlmia et al. found greater Sjs in males than females. Comparing the joint spaces between right and left sides, most of the previous studies revealed no significant differences; however, the studies ,,, were contradictory to this to find the significant differences for Ajs , and Pjs. Studies evaluated joint space against various disc positions,,,, the disc position was determined using magnetic resonance imaging, the joint spaces were measured using tomography, and the most of the sample was in the age range of 7–20 years. Ikeda and Kawamura and Manjula et al. estimated the joint space in normal disc position and found no significant differences either in gender-wise or side-wise comparisons., While Kinniburgh et al. found a significant increase in Ajs and reduction in Sjs in patients with anterior disc position than in normal. The studies compared the joint space morphometrics in patients with TMD and in normal asymptomatic individuals.,,,, Major et al. attempted to establish the associations between osseous characteristics of TMJ and internal derangement and observed the relationship between disc displacement and reduced Sjs, increased Ajs and Pjs. It could be inferred that internal derangement in TMJ may be associated with functional osseous adaptation within the joint. While Pereira and Gavião found the weak positive correlation between the Ajs and the dysfunction index with no significant differences in relation to gender and side of the TMJ, Tsuruta et al. investigated condylar morphological changes while condylar movement from the intercuspal position to the reference position dividing subjects into two groups as with or without condylar bone changes. No significant differences in the width of the Ajs and Pjs were observed in two groups. Imanimoghaddam et al. found that the mean values of the Ajs were significantly greater in the TMD group than normal. The significant correlation was observed between Pjs and Sjs in normal and TMD groups. Alves et al. evaluated  patients with TMD in elderly age group (23–71 years) than in other studies and found diminished joint spaces, especially Pjs in TMD patients. The symptomatic patients were also evaluated as per the skeletal morphology and type of growth pattern, the negative correlation was observed between the Sjs and vertical skeletal pattern, the Sjs was found to be decreased in vertical growth pattern patients and increased in horizontal growth pattern patients, Park et al. categorized the patients based on the mandibular plane angle as hypo-, normo-, and hyper-divergent groups. The significant differences were observed for Sjs in the hypo- and hyper-divergent groups. Kikuchi et al., in their study, found a significant negative correlation between the gonial angle and the Ajs and of ramus plane angle with Pjs, Mjs, and Ljs. It was suggested that the craniofacial growth pattern may affect the joint spaces and condylar position. Cohlmia et al. performed the morphological assessment of TMJ with respect to overjet and ANB angle. The adults had significantly smaller joint space as compared to children, the left Ajs and right Pjs were smaller, with significant differences in measurements in Class III and Class II malocclusion cases. The insufficient overjet cases had significantly larger Pjs, while no differences seen as per the varied ANB angles. Comparing joint space as per the type of malocclusion, there were many observations as mentioned. Irrespective of type of malocclusion, the Ajs was found to be smaller as compared to Sjs and Pjs in general except in few studies;,, furthermore, in most of the observations, the Pjs was smaller than Sjs with few exceptions.,,,,,, The significant anterior positioning was observed in Class I and Class II malocclusion cases with reduced Ajs.,,, The greater anterior positioning was seen in Class I malocclusion cases than Class II and III cases., Krisjane et al. found significantly greater joint space measurements in Class II than Class III cases. Henriques et al. have evaluated the joint spaces in two contact positions of teeth, that is, centric relation and maximum intercuspation position in normal occlusion and Class I, II, and III malocclusion cases, and found no significant differences between them. However, the measurement technique here was different than that was used in most of the other studies. Fraga et al. investigated and compared the condylar positions and joint spaces in asymptomatic subjects with Class I, II, and III malocclusion. Overall, condylar decentralization and bilateral symmetry were the features observed in all the study groups; however, the greatest condylar decentralization was found in Class II malocclusion group. Few of the previous studies performed the joint spaces analysis before and after the orthodontic treatment.,, Major et al. found a significant increase in Ajs dimension in treated nonextraction cases and no joint space change in extraction cases. No other significant observations could be determined in either group for length of Class II elastic wear or means of extraction space closure. Although statistically significant, a mean increase in joint space of approximately 0.39–0.49 mm was not clinically significant. The increase in Ajs in nonextraction cases was irrespective of change in Pjs; hence, it may be suggested that it may be as a result of a change in condylar rotation in vertical dimension of occlusion or remodeling of articular surface of the condyle and articular eminence. Leonardi et al. examined the condyle-fossa relationships and joint spaces in treated functional posterior cross-bite patients; the patients were investigated before and after the treatment for palatal expansion and were also compared with noncross-bite side and with normal control. The joint spaces were greater in posttreatment measurements as compared to that in pretreatment measurements that were statistically significant for the Sjs, however, of small magnitude to influence clinically. Coskuner and Ciger evaluated the TMJ in the Class II malocclusion cases before and after the orthodontic treatment and the differences were nonsignificant. On the whole, the greater variations were observed in the study findings with respect to joint space analysis, its comparisons and associations with other parameters; the study findings were highly individualized and incomparable. The literature review suggests that although many studies were conducted on joint space analysis, the generalized or common inference could not be drawn as there was lot of heterogeneity with regards to sample size, age groups, type of sample included methodology, and the malocclusion type and the joint space measured. The joint space analysis and condyle-fossa relationship may be of interest to understand the existing or ensuing TMD; however, currently, a few data are available to have its implications in TMD or to have its clinical application in orthodontic diagnosis and treatment. Although the altered condylar or disc position may manifest in altered joint space, the definitive data are awaited to reach to the concrete conclusions. The present review work would be of help to gain insight to predict the TMD with respect to joint space morphometrics and also has provided baseline data against which future research work may be planned. Major P, Kamelchuk L, Nebbe B, Petrikowski G, Glover K. Condyle displacement associated with premolar extraction and nonextraction orthodontic treatment of class I malocclusion. Am J Orthod Dentofacial Orthop 1997;112:435-40. Mealey B. Burket's Oral Medicine-Diagnosis and Treatment. Temporomandibular Joint Disorders. Spain: BC Decker Inc.; 2003. p. 271-306. Merigue LF, Conti AC, Oltramari-Navarro PV, Navarro Rde L, Almeida MR. Tomographic evaluation of the temporomandibular joint in malocclusion subjects: Condylar morphology and position. Braz Oral Res 2016;30. pii: S1806-83242016000100222. Paknahad M, Shahidi S. Association between mandibular condylar position and clinical dysfunction index. J Craniomaxillofac Surg 2015;43:432-6. Pereira LJ, Gavião MB. Tomographic evaluation of TMJ in adolescents with temporomandibular disorders. Braz Oral Res 2004;18:208-14. Kim JB. Normal temporomandibular joint space. J Korean Assoc Oral Maxillofac Surg 2000;26:279-83. Dalili Z, Khaki N, Kia SJ, Salamat F. Assessing joint space and condylar position in the people with normal function of temporomandibular joint with cone-beam computed tomography. Dent Res J (Isfahan) 2012;9:607-12. Ludlow JB, Nolan PJ, McNamara JA. Accuracy of measures of temporomandibular joint space and condylar position with three tomographic imaging techniques. Oral Surg Oral Med Oral Pathol 1991;72:364-70. Okur A, Ozkiris M, Kapusuz Z, Karaçavus S, Saydam L. Characteristics of articular fossa and condyle in patients with temporomandibular joint complaint. Eur Rev Med Pharmacol Sci 2012;16:2131-5. Tsuruta A, Yamada K, Hanada K, Hosogai A, Kohno S, Koyama J, et al. The relationship between morphological changes of the condyle and condylar position in the glenoid fossa. J Orofac Pain 2004;18:148-55. White SC, Pharoh MJ. Diagnostic Imaging of Temporomandibular Joint. In: Petrikowski C, editor. Oral Radiology-Principles and Interpretation. 6th ed. Missouri: Mosby Publishers; 2009. p. 473-505. Nancy A. Tencate's Oral Histology- Development, Structure and Functions. Temporomandibular Joint. 8th ed., Ch. 13. Missouri: Elsevier-Mosby Publishers; 2013. p. 400. Blaschke DD, Blaschke TJ. Normal TMJ bony relationships in centric occlusion. J Dent Res 1981;60:98-104. Ricketts RM. Variations of the temporomandibular joint as revealed by cephalometric laminagraphy. Am J Orthod 1950;36:877-98. Katsavrias EG. Morphology of the temporomandibular joint in subjects with class II division 2 malocclusions. Am J Orthod Dentofacial Orthop 2006;129:470-8. Droel R, Isaacson RJ. Some relationships between the glenoid fossa position and various skeletal discrepancies. Am J Orthod 1972;61:64-78. Alves N, Deana NF, Schilling QA, González VA, Schilling LJ, Pastenes RC. Assessment of TMJ condylar position and joint space in Chilean individuals with temporomandibular disorders. Int J Morphol 2014;32:32-5. Imanimoghaddam M, Madani AS, Mahdavi P, Bagherpour A, Darijani M, Ebrahimnejad H, et al. Evaluation of condylar positions in patients with temporomandibular disorders: A cone-beam computed tomographic study. Imaging Sci Dent 2016;46:127-31. Staggers JA. Vertical changes following first premolar extractions. Am J Orthod Dentofacial Orthop 1994;105:19-24. Mah JK, Huang JC, Choo H. Practical applications of cone-beam computed tomography in orthodontics. J Am Dent Assoc 2010;141 Suppl 3:7S-13S. Hodges RJ, Atchison KA, White SC. Impact of cone-beam computed tomography on orthodontic diagnosis and treatment planning. Am J Orthod Dentofacial Orthop 2013;143:665-74. Cohlmia JT, Ghosh J, Sinha PK, Nanda RS, Currier GF. Topographic assessment of temporomandibular joints in patients with malocclusion. Angle Orthod 1996;66:27-36. Kinniburgh RD, Major PW, Nebbe B, West K, Glover KE. Osseous morphology and spatial relationships of the temporomandibular joint: Comparisons of normal and anterior disc positions. Angle Orthod 2000;70:70-80. Akahane Y, Deguchi T, Hunt NP. Morphology of the temporomandibular joint in skeletal class iii symmetrical and asymmetrical cases: A study by cephalometric laminography. J Orthod 2001;28:119-28. Kikuchi K, Takeuchi SE, Tanaka E, Shibaguchi T, Tanne K. Association between condylar position, joint morphology and craniofacial morphology in orthodontic patients without temporomandibular joint disorders 2003 Blackwell Publishing Ltd. J Oral Rehabil 2003;30:1070-5. Ikeda K, Kawamura A. Assessment of optimal condylar position with limited cone-beam computed tomography. Am J Orthod Dentofacial Orthop 2009;135:495-501. Martina E, Silvaa J, Piresb C, Poncesa M, Lopesa J. Sagittal joint spaces of the temporomandibular joint: Systematic review and meta-analysis. Rev Port Estomatol Med Dent Cir Maxilofac 2015;56:80-8. Vitral RW, Telles Cde S, Fraga MR, de Oliveira RS, Tanaka OM. Computed tomography evaluation of temporomandibular joint alterations in patients with class II division 1 subdivision malocclusions: Condyle-fossa relationship. Am J Orthod Dentofacial Orthop 2004;126:48-52. Gökalp H. Magnetic resonance imaging assessment of positional relationship between the disk and condyle in asymptomatic young adult mandibular prognathism. Angle Orthod 2003;73:550-5. 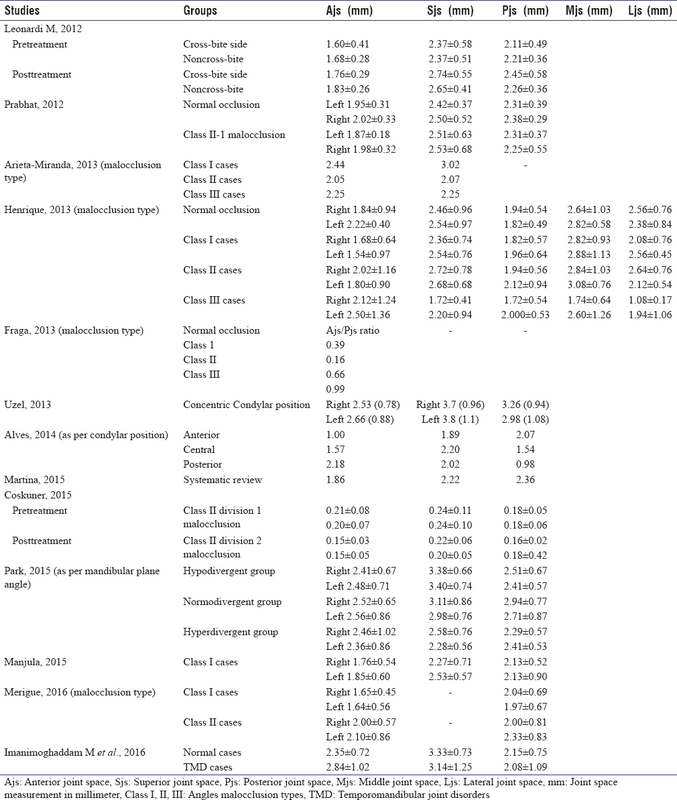 Krisjane Z, Urtane I, Krumina G, Zepa K. Three-dimensional evaluation of TMJ parameters in class II and class III patients. Stomatologija 2009;11:32-6. 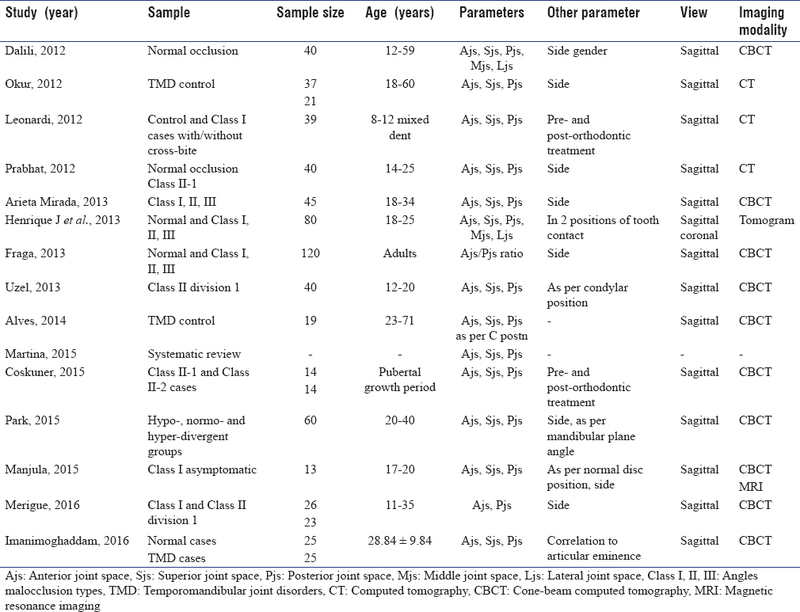 Agrawal V, Jain S. A computed tomographic analysis of condyle-fossa relationship in normal class I vertically grower males and its correlation with mandibular morphology & Dental parameters. J Ind Orthod Soc 2010;44:34-41. Seren E, Akan H, Toller MO, Akyar S. An evaluation of the condylar position of the temporomandibular joint by computerized tomography in class III malocclusions: A preliminary study. Am J Orthod Dentofacial Orthop 1994;105:483-8. Pullinger A, Hollender L. Variation in condyle-fossa relationships according to different methods of evaluation in tomograms. Dentofac Orthop 1987;91:200-6. Rodrigues AF, Fraga MR, Vitral RW. Computed tomography evaluation of the temporomandibular joint in class I malocclusion patients: Condylar symmetry and condyle-fossa relationship. Am J Orthod Dentofacial Orthop 2009;136:192-8. Rodrigues AF, Fraga MR, Vitral RW. Computed tomography evaluation of the temporomandibular joint in class II division 1 and class III malocclusion patients: Condylar symmetry and condyle-fossa relationship. Am J Orthod Dentofacial Orthop 2009;136:199-206. Uzel A, Özyürek Y, Öztunc H. Condyle position in Class II Division 1 malocclusion patients: Correlation between MPI records and CBCT images. J World Fed Orthod 2013;2:e65-70. Kamelchuk LS, Grace MG, Major PW. Post-imaging temporomandibular joint space analysis. Cranio 1996;14:23-9. Henriques JC, Fernandes Neto AJ, Almeida Gde A, Machado NA, Lelis ER. Cone-beam tomography assessment of condylar position discrepancy between centric relation and maximal intercuspation. Braz Oral Res 2012;26:29-35. Christiansen EL, Chan TT, Thompson JR, Hasso AN, Hinshaw DB Jr., Kopp S, et al. Computed tomography of the normal temporomandibular joint. Scand J Dent Res 1987;95:499-509. Christiansen EL, Thompson JR, Zimmerman G, Roberts D, Hasso AN, Hinshaw DB Jr, et al. Computed tomography of condylar and articular disk positions within the temporomandibular joint. Oral Surg Oral Med Oral Pathol 1987;64:757-67. Prabhat KC, Kumar Verma S, Maheshwari S, Ahmad I, Tariq M. Computed tomography evaluation of craniomandibular articulation in class II division 1 malocclusion and class I normal occlusion subjects in North Indian population. ISRN Dent 2012;2012:312031. Park IY, Kim JH, Park YH. Three-dimensional cone-beam computed tomography based comparison of condylar position and morphology according to the vertical skeletal pattern. Korean J Orthod 2015;45:66-73. Pullinger A, Hollender L. Variation in condyle-fossa relationships according to different methods of evaluation in tomograms. Oral Surg Oral Med Oral Pathol 1986;62:719-27. Fraga MR, Rodrigues AF, Ribeiro LC, Campos MJ, Vitral RW. Anteroposterior condylar position: A comparative study between subjects with normal occlusion and patients with class I, class II division 1, and class III malocclusions. Med Sci Monit 2013;19:903-7. Major PW, Kinniburgh RD, Nebbe B, Prasad NG, Glover KE. Tomographic assessment of temporomandibular joint osseous articular surface contour and spatial relationships associated with disc displacement and disc length. Am J Orthod Dentofacial Orthop 2002;121:152-61. Kecik D, Kocadereli I, Saatci I. Condylar disc relationships and vibration energy in asymptomatic class I 9- to 12-year olds. Angle Orthod 2005;75:54-62. Leonardi R, Caltabiano M, Cavallini C, Sicurezza E, Barbato E, Spampinato C, et al. Condyle fossa relationship associated with functional posterior crossbite, before and after rapid maxillary expansion. Angle Orthod 2012;82:1040-6. Arieta-Miranda JM, Silva-Valencia M, Flores-Mir C, Paredes-Sampen NA, Arriola-Guillen LE. Spatial analysis of condyle position according to sagittal skeletal relationship, assessed by cone beam computed tomography. Prog Orthod 2013;14:36. Coskuner HG, Ciger S. Three-dimensional assessment of the temporomandibular joint and mandibular dimensions after early correction of the maxillary arch form in patients with class II division 1 or division 2 malocclusion. Korean J Orthod 2015;45:121-9. Manjula WS, Tajir F, Murali RV, Kumar SK, Nizam M. Assessment of optimal condylar position with cone-beam computed tomography in south indian female population. J Pharm Bioallied Sci 2015;7:S121-4. Burke G, Major P, Glover K, Prasad N. Correlations between condylar characteristics and facial morphology in class II preadolescent patients. Am J Orthod Dentofacial Orthop 1998;114:328-36.